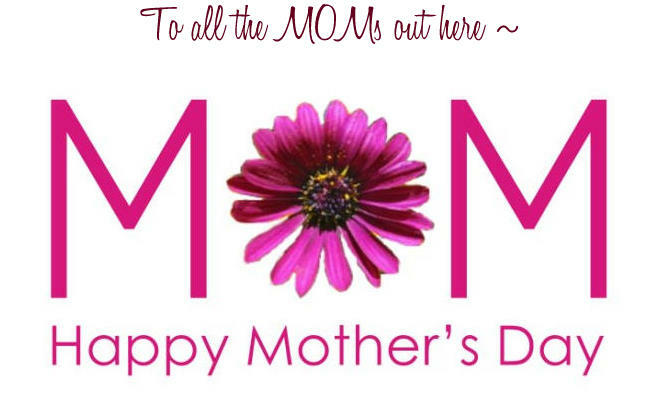 Happy Mother’s Day to each and every one of you who has mothered a child of your own or a child of another. (Frankly, I cannot imaging anyone who sews or reads this blog who has not reached out to children and grandchildren of their own and/or others.) The love and attention showered on our precious children is the best use of our precious time. I’m at that happy time of life when I can enjoy my beloved adult children as well as the beloved grandchildren they have given us. My daughter Rebecca and daughter-in-law Shelly are both incredible, wonderful mothers whom I admire and love dearly. I wish each of you a happy day filled with appreciation from and for your loved ones. Around here it has been busy, busy, BUSY!!!! We’ve been blessed with almost back to back and overlapping visits from our four grandchildren and even more happy chaos. In a future post I’ll tell you all about Laurel’s luau 9th birthday party, new fleece blankets for each grandchild and the progress of our newly tamed feral cats and the kittens. So once again, I am rerunning an old post, though I do have a few new thoughts and plans. 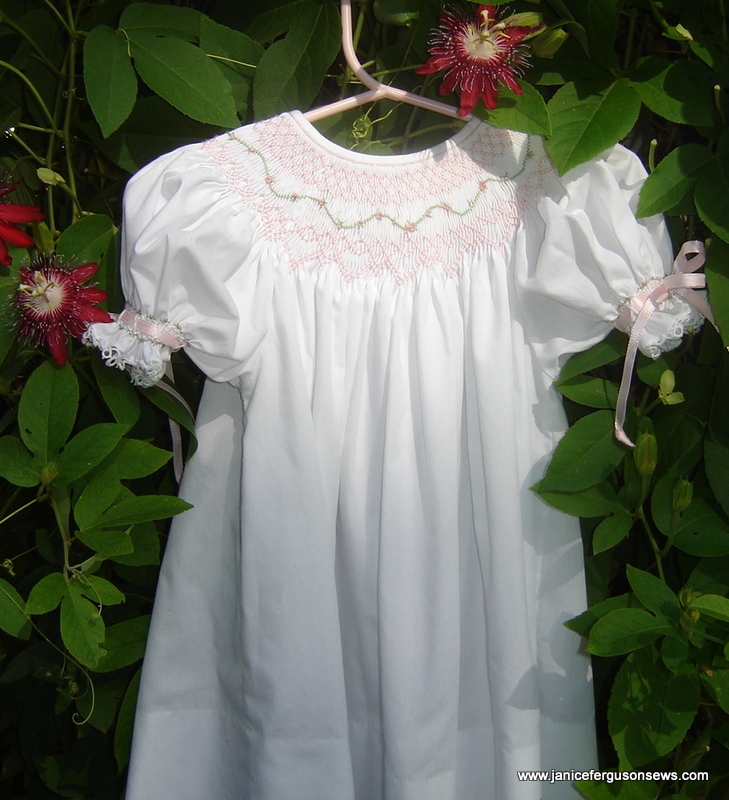 I hope to make a very similar dress for new granddaughter Vivian Rose before her first birthday. FYI, Alysha is almost 5, adorable and the apple of her grandparents’ eyes. 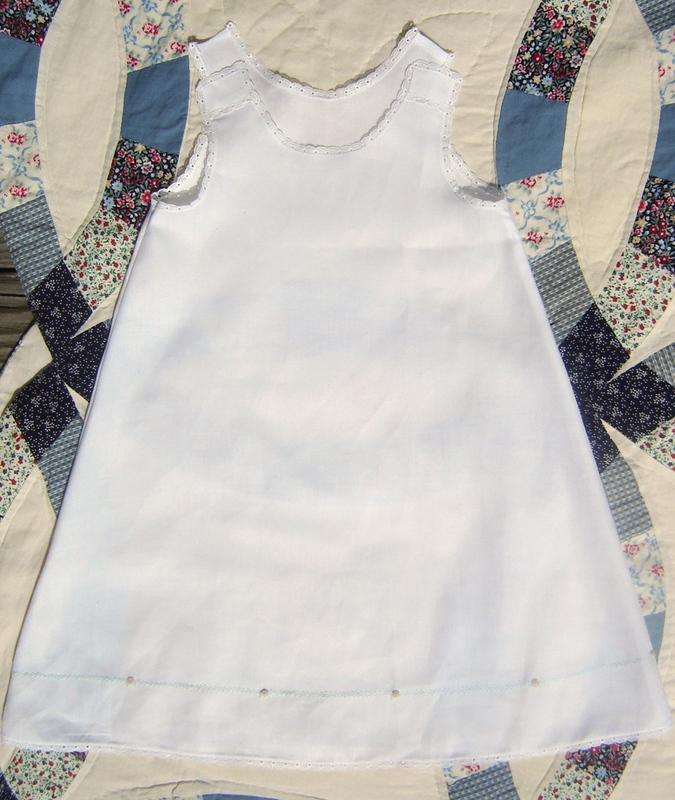 Swiss flannel Old Fashioned Baby slip with hand embroidery—yes, I embroidered this by hand! Here at the cabin, this quilt was the only thing I could find to use as a background. While we at here our cabin in North Carolina, I am enjoying some uninterrupted sewing time. This is the first project I have finished (except for buttons and buttonholes) for Grandbaby Girl #2, due around Christmas. December weather in Florida could be 28 or 90 degrees. So for a start, I am planning several daygowns and at least one Swiss flannel slip for cool days. NOTE: I promised that my spa wrap tutorial would be posted today, but it will probably be later this evening. I’m half way through it all, but had to halt. So sorry, but real life has a way of cutting into my sewing life time. 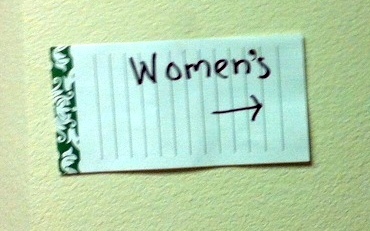 After some remodeling at our church, the ladies bathroom was further removed from the Fellowship Hall. 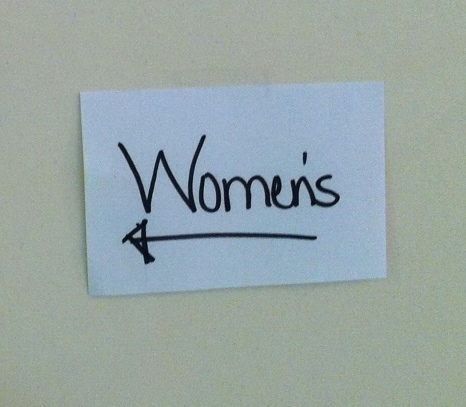 In order to make it easier for visitors and newcomers to find their way, this note was posted inside the hall that led to the bathroom. Now, I’m not a gal with time on her hands, not someone looking to fill up the lonely hours of my day with whatever sewing project I can wheedle into the sewing room. But it seemed to me that we needed a more substantial sign than this paper note. So I embroidered the sign above. I thought the thread colors should be somewhat subdued and conservative. Actually, I embroidered two because there is a turn in the hall with a second directional paper note. The floral corner design is from Martha Pullen’s Zundt 1 collection. 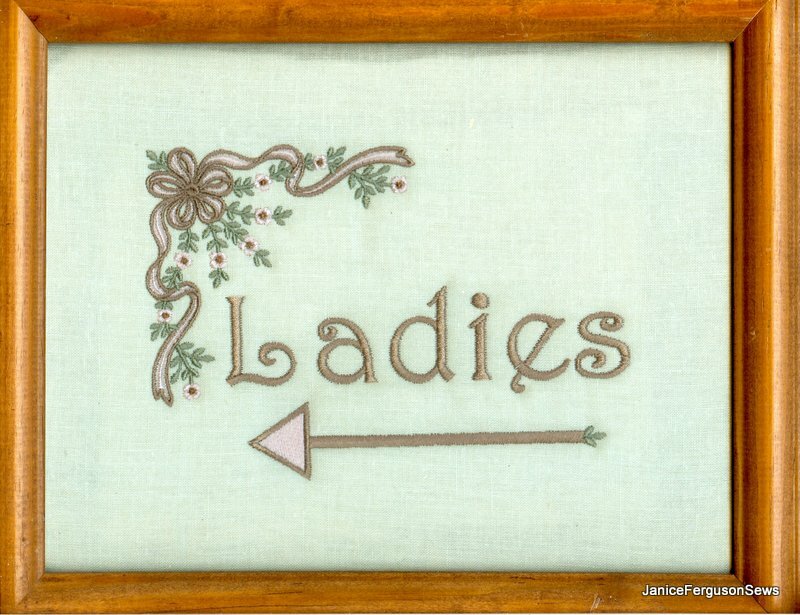 Monogram Wizard Plus provided the Curly Q font that spelled out Ladies and also provided the basic shapes for the arrow. My Ladies signs aren’t rocket science and they won’t make the world a better place or delight a child. But I think they are more pleasing to the eye and much more durable than those posted now. I am also reminded that my fancy workhorse Brother Quattro can be put to use for practical purposes in addition to making elegant children’s clothing and home dec items. Now, why do I think signage is so important? Well, let me tell you. I was teaching in Maggie Valley, NC, at one of Mildred Turner’s fabulous, always-sold-out Sewing in the Mountains schools. The day before classes began, I was assigned to pick up another teacher at the Asheville airport, about an hour away. I left late, got lost and was worried that I would arrive after the flight landed. So I did some unconscionable speeding. As I rushed, breathless, into the completely empty lobby, I saw that I had 6 minutes to spare! Yippee! Time for a bathroom break! At every ticket station was an agent who looked up as I rushed in. I stood tall (as tall as a 5′-1/2″ lady can), took a deep breath and calmly walked into the bathroom directly across from the first bank of ticket counters. He calmly finished his business and smiled, saying, “I don’t think so.” Then I noticed the urinal. As I rushed out, every agent was staring at me, grinning from ear to ear. I ducked into the POORLY MARKED!!! ladies room a little further down the lobby and stayed there until I heard the rush of arriving passengers. Only then did I sneak out of the bathroom, unnoticed by the agents. As it turned out, I was late picking up the other teacher. But I didn’t care. This is an amazing dress, an example of what I would call heirloom recycling. 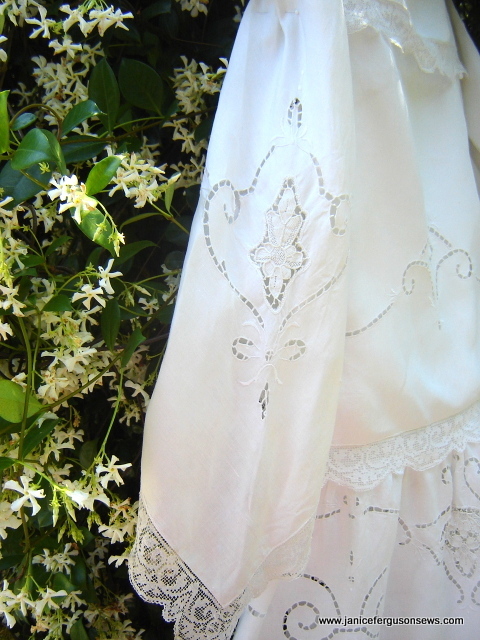 Whoever made this dress embraced the “green” philosophy–or simply needed a white dress and had a pretty tablecloth. Whatever. On a yard sale/church bazaar Saturday outing, a mother/daughter duo came across this dress. Well aware of my penchant for antique textiles, the shopping duo decided then and there to gift it to me. What wonderful friends! And, of course, I was delighted. 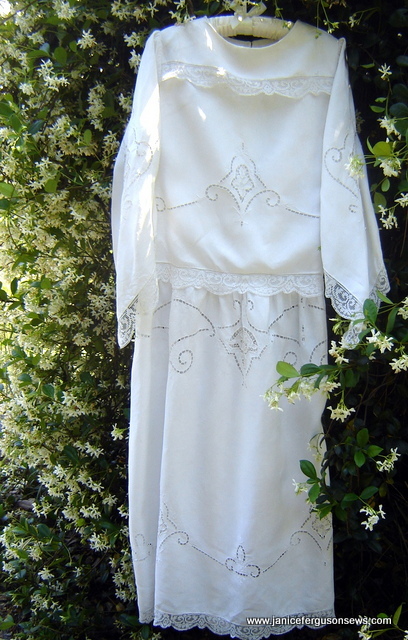 Remarkable for a number of reasons, the dress is made from a beautifully stitched fine linen tablecloth. It was not immediately obvious that the cutwork, surface embroidery and needle lace inserts were not embellishments meant for a special gown. 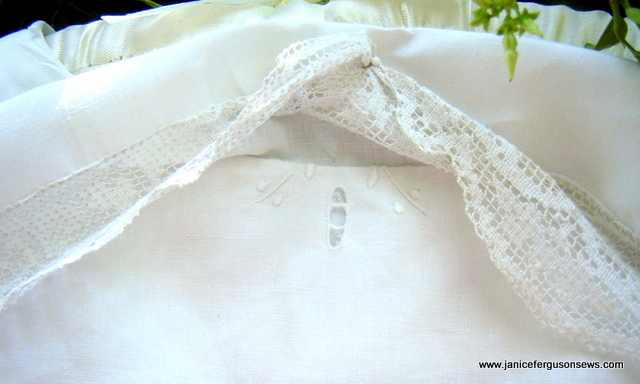 My first clue that this was a tablecloth was when I discovered the embroidery at the neckline, under the bodice overlay. Hmmmmmmm….no reason to embroider there. 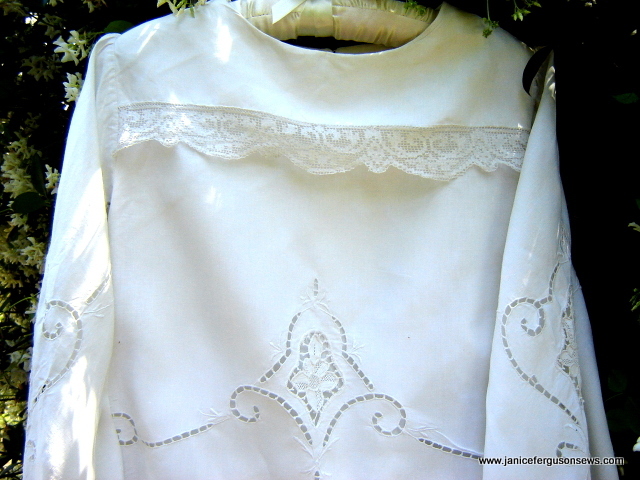 It is pieced together so artfully that the placement of the designs and the needle lace seem well planned for a dress. 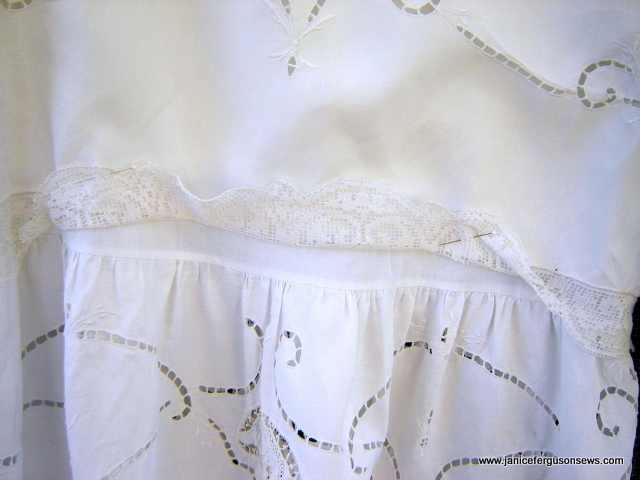 The skirt was cut so that the cutwork lines up at the side seams. 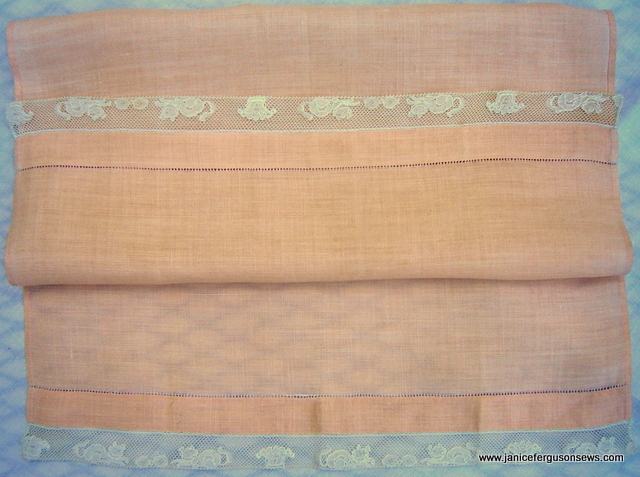 The unusual sleeve style incorporates a corner of the cloth. At the upcoming mother-daughter church luncheon, a display of vintage wedding gowns and dresses will be featured. So I pulled out the dress and proceeded to launder it. 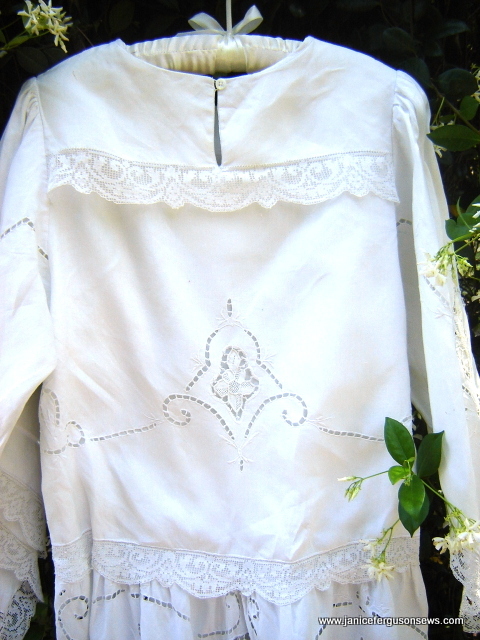 That’s when I discovered the embroidery at the neckline and the non-standard skirt attachment. Close examination convinced me that the cutwork and embroidery were done by someone other than the seamstress who constructed this garment. There is a noticeable disparity between the workmanship of the handwork and the construction. This is most noticeable with lace attachment. 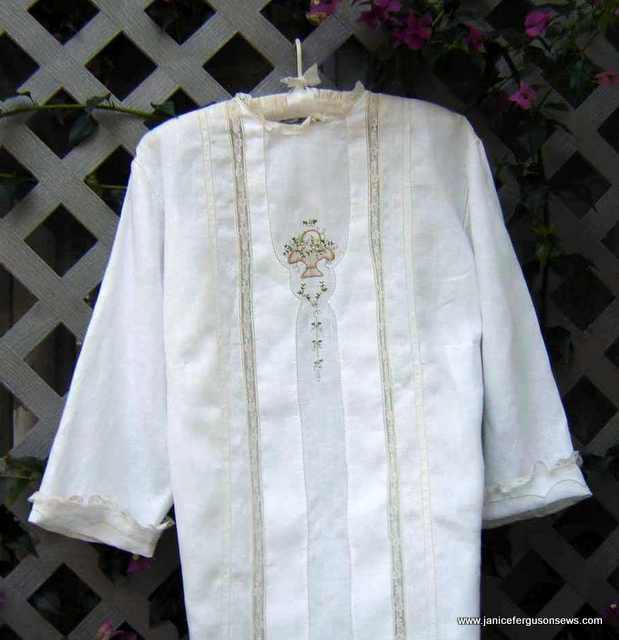 It is simply straight stitched onto what appears to be a machine rolled and whipped edge at the hem and sleeve edges. 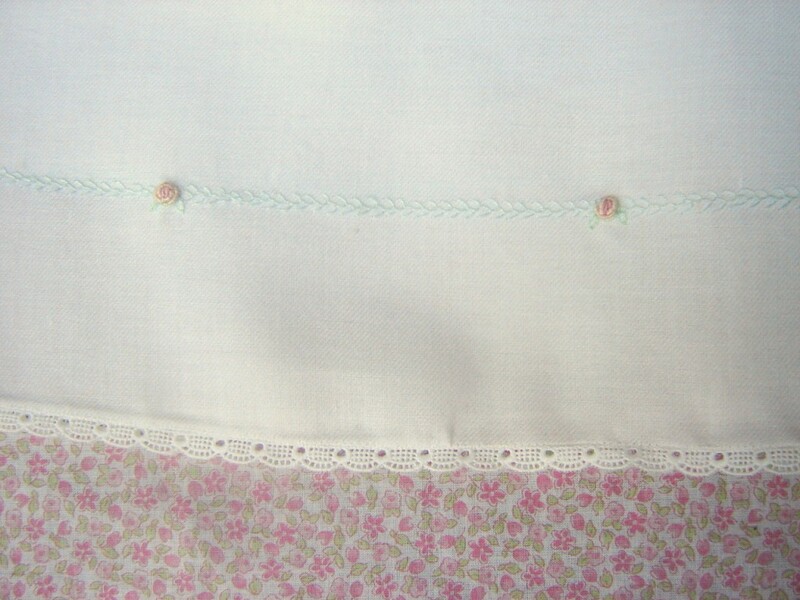 However, on the front and back yoke overlays, which are lined, it is very nicely hand stitched. 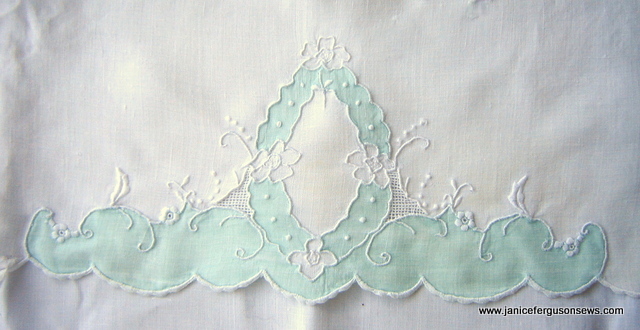 The color has been edited to show stitches joining lace to overlay. It seems to me that the short opening at the center back would make it very difficult to put the dress on. 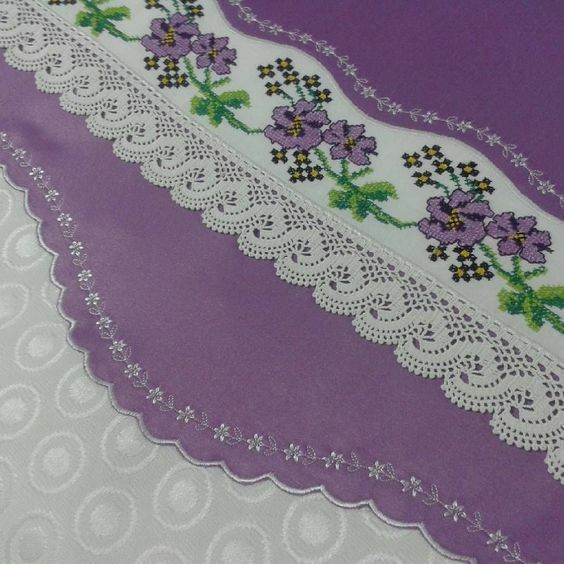 But it’s likely that the seamstress/designer didn’t want break the horizontal line of the lace on the overlay. Of course, I wonder for what special occasion was the dress made? It could have been a confirmation or graduation dress. It even could have been a wedding dress. Whatever. Scarlet O’Hara would have found this a welcome, comfortable change from her velvet drapery dress. 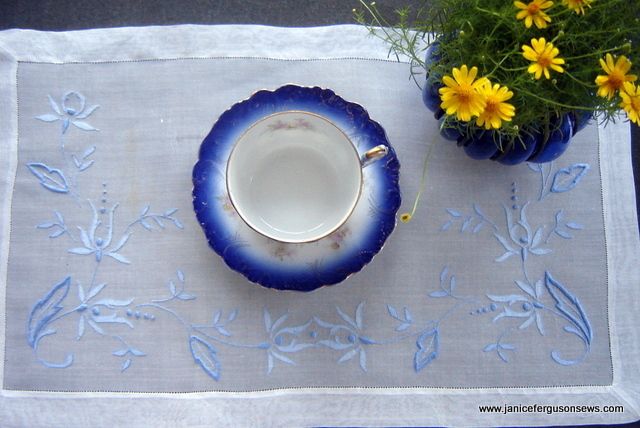 guest or tea towel with fil tire’, surface embroidery, applique’ and scalloped cutwork edge. There are so many lovely and interesting textiles from the previous Once-in-a-Lifetime Estate Sale that they deserve another post. This is part two. But before you look further, I want to apologize for the boring layout of these beauties. I’m struggling with Laurel’s Easter dress and don’t have much time. So they are simply laid out, plain and simple. The first is this towel, which was probably for the use of guests.I love all the details and embellishments. Of the same style and quality is a yellow version. The linen is so fine that the patio table top shows through both layers of the folded towel. Notice the kitten Binche lace and the tiny pinstitch holes. The peach linen towel above was probably in a children’s bathroom. The kitten Binche “picture” lace is very childlike. 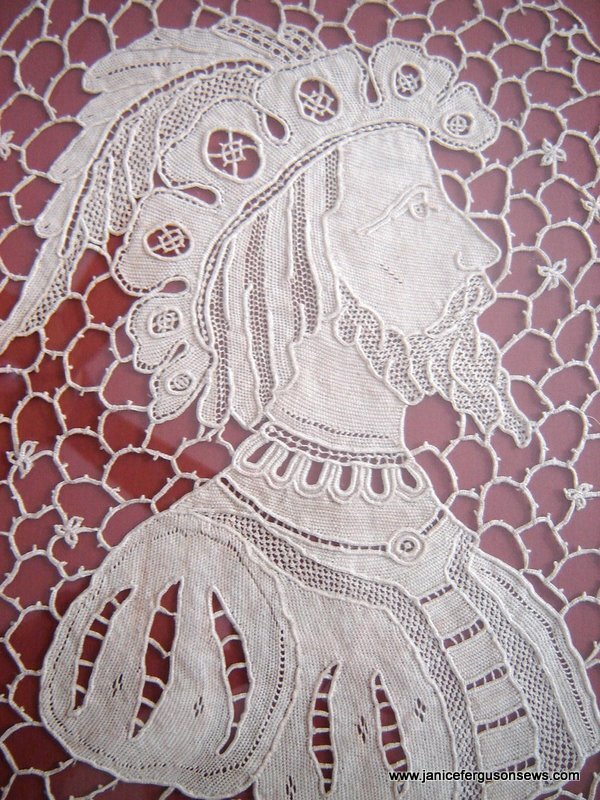 I have a lot of antique Binche lace that I will soon put up for sale. 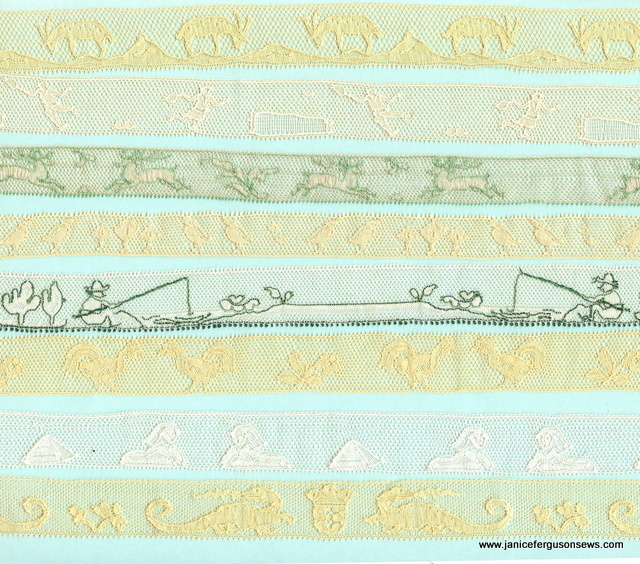 The patterns are not all juvenile, but include elephants, fisher boys, deer, tennis players and even King Tut. A few are shown below. Next is a pretty 16″ centerpiece. Coronation cord has fascinated me since I first saw it. It came in several sizes and many colors. 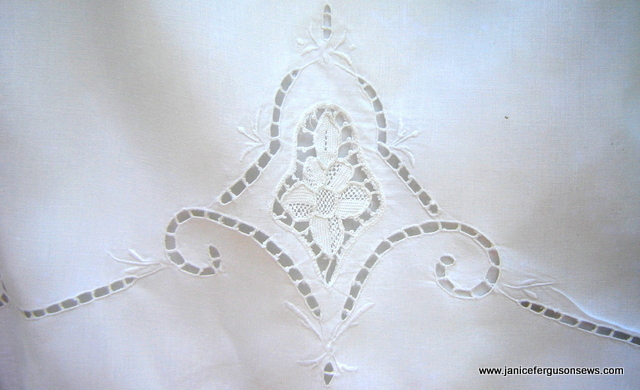 It is simply couched in place, but renders the look of padded satin or bullion stitches. This was the most amazing estate sale I had ever seen, or ever will again. It was truly a once-in-a-lifetime shopping opportunity to acquire beautiful things. 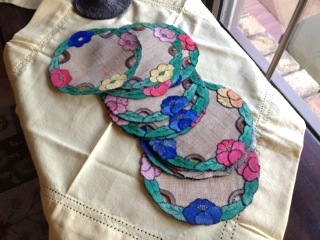 First, a few details about one of my finds at that sale, a set of 6 placemats and napkins with a matching table runner. 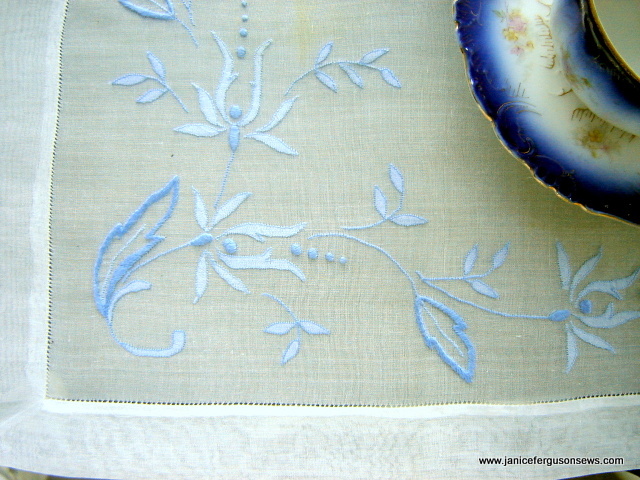 Shadow embroidered placemat with surface embroidery and hemstitching. The shadow embroidery on this luncheon set is absolutely flawless. Worked in two shades of blue, the stitches are so tiny and so regularly spaced that it’s hard to believe this is handwork. The surface embroidery is equally remarkable. 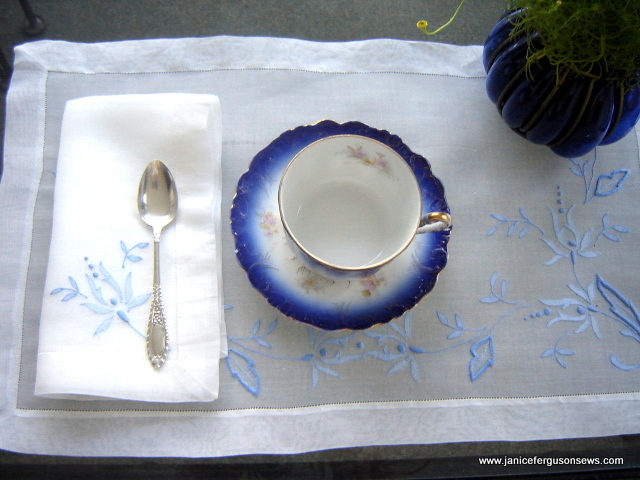 The set of six placemats and napkins includes a table runner. 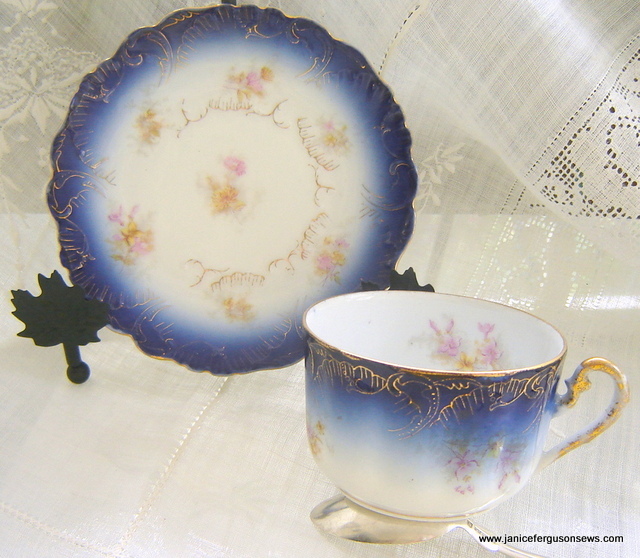 With my Blue Willow china, it makes a pretty setting for lunch. For tea, flow blue cups are elegant. My 7 yo granddaughter Laurel and I enjoy having tea on the breakfast porch with these cups. Robert, 6, sometimes joins us but prefers a no-nonsense Gator mug. So here is the story about how this all came about. My mother’s friend, Marybelle, had a daughter who did estate sales and auctions in New England. She didn’t liquidate little Ma & Pa farms or cottages but rather huge estates with names like Rockefeller or DuPont. Mind you, I don’t know the surnames, but the implication was that they were of this status, rich and/or famous. Suzanne bought these, then duplicated the technique. The article is featured in Creative Needle magazine. 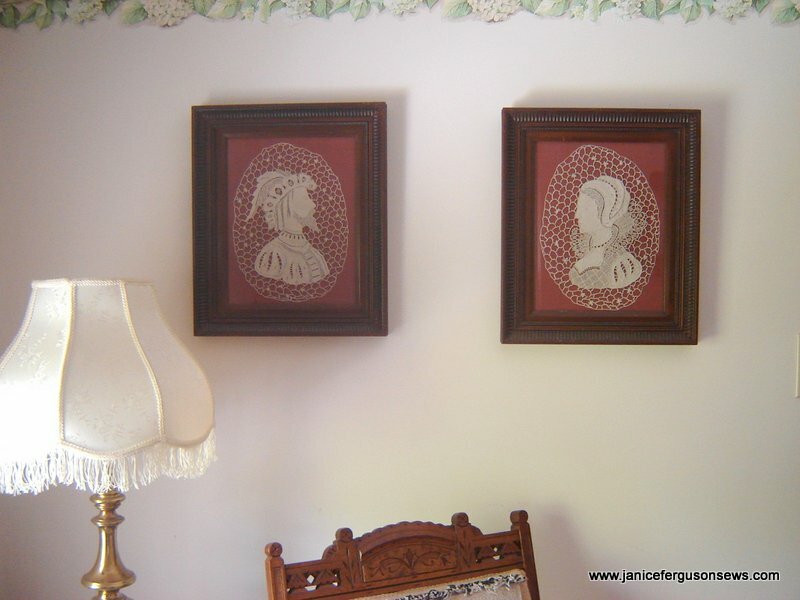 Of all my textile treasures, these lace portraits are among my very favorites. To be perfectly honest, I know absolutely nothing about how they were created. Do you know? I would really appreciate any information you could share. The background/field surrounding the busts appears to be a sort of tatting or crochet. The fill pattern in parts of each figure remind me of Battenburg techniques. But for all I know, there may be an obscure, obsolete needleart for creating such stitched images. I can say with certainty that they were made by hand. 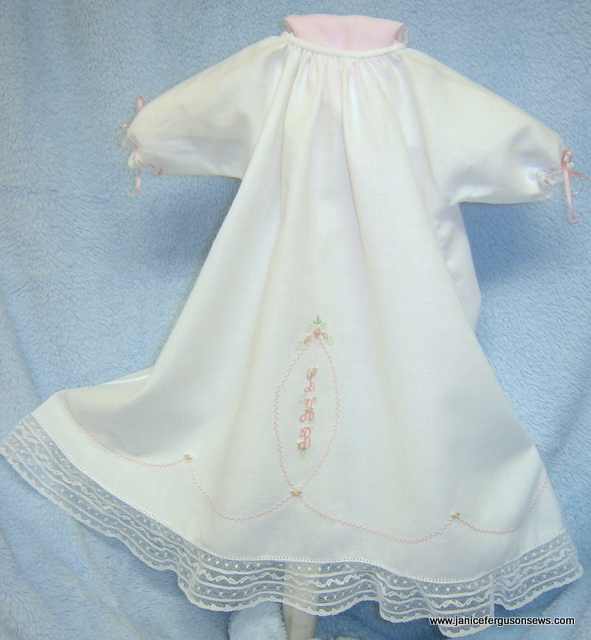 This preemie daygown was made for a tiny baby girl who was born last week weighing 3 lbs. 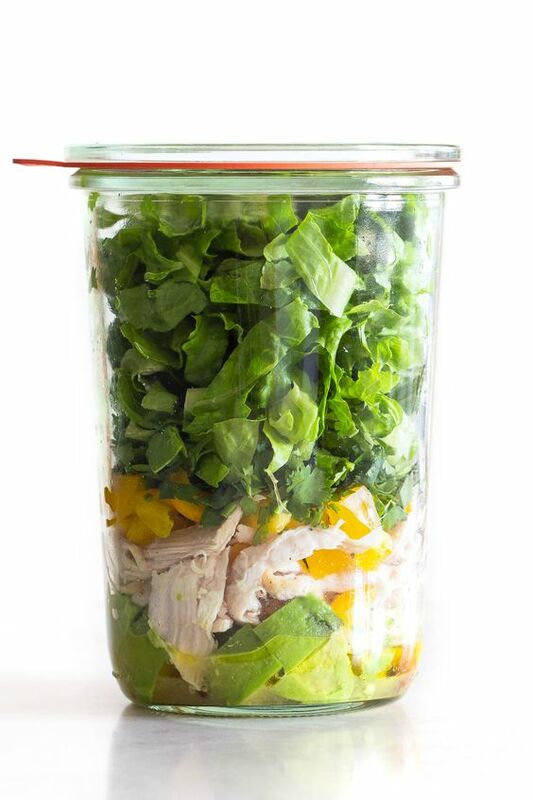 9 ounces. Almost 8 weeks before her due date, she is doing quite well in the neonatal intensive care unit at an excellent hospital. But she is sooooo little! Her mother was a classmate of my daughter’s as well as one of my favorite students in my children’s sewing classes. Now she is a wife and new mother to a precious baby daughter who will probably be in the hospital for some time. 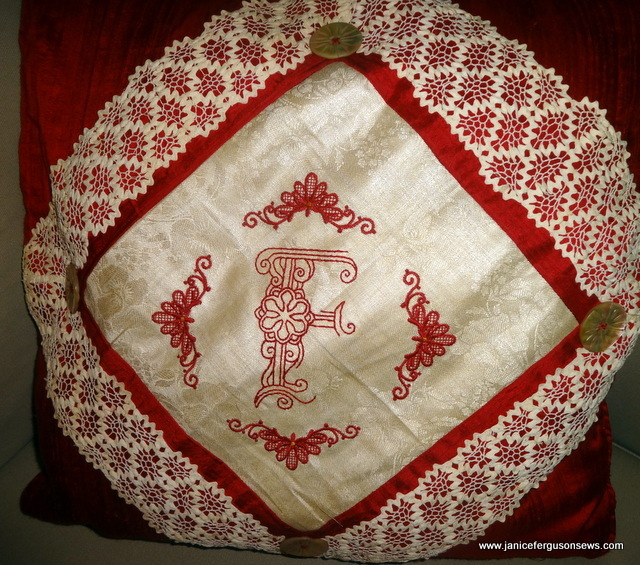 The pillow is red silk dupioni trimmed with vintage rick rack lace and antique buttons. 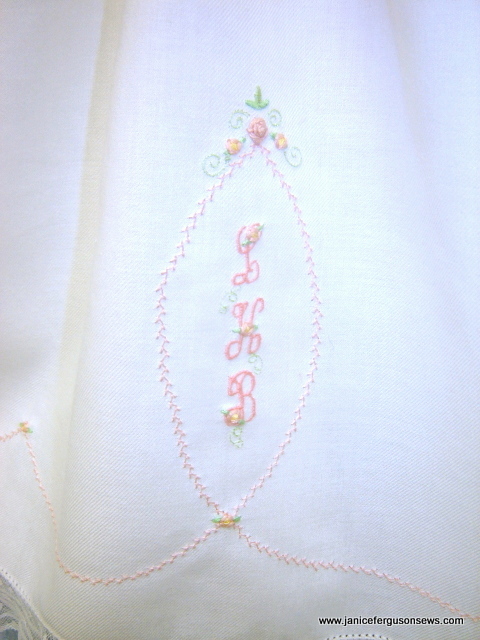 The center panel with monogram was stitched on an antique linen damask napkin. 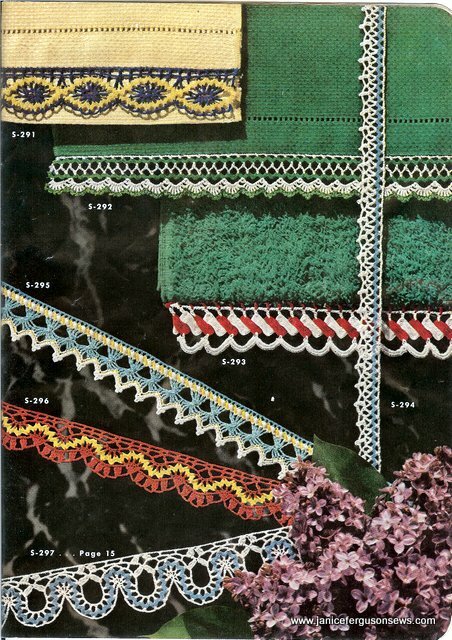 I’ve always been enchanted by old textiles, laces in particular. Rick rack lace is one of the most unique and intriguing in my collection. It sounds so tacky! 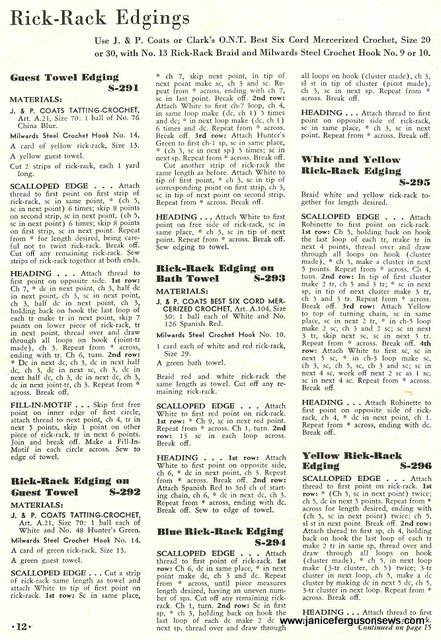 Certainly it can be and undoubtedly some good-taste challenged lady in the 40’s or 50’s created some unattractive yardage using this technique. But it can be so charming, if not delicate. 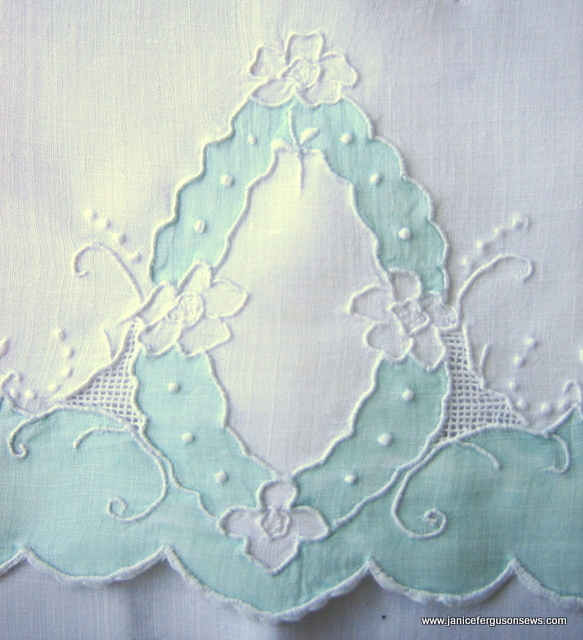 Rick rack lace seems to have been very popular for towel and pillowcase edgings. In fact, I have a length of it in red and white that was obviously used on a pillow slip. The sturdiness of this trim makes it very suitable for heavily laundered items. This white length is my favorite. 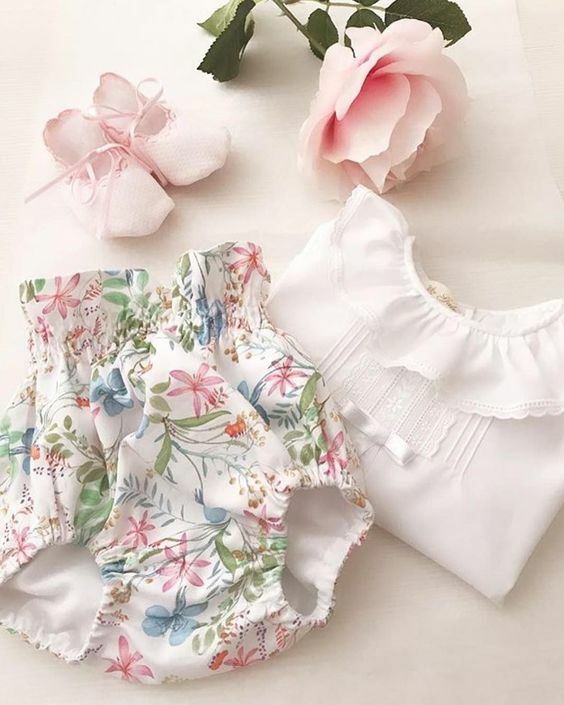 I would love to have enough to edge a baby blanket, but instead will have to settle on using it for trim on doll dresses for granddaughter Laurel’s American Girl Molly. She was a miss of the 40’s so her time frame is appropriate for its use. I envision it around the raised waist of a velveteen dress. The texture contrast would be very pleasing, I think. 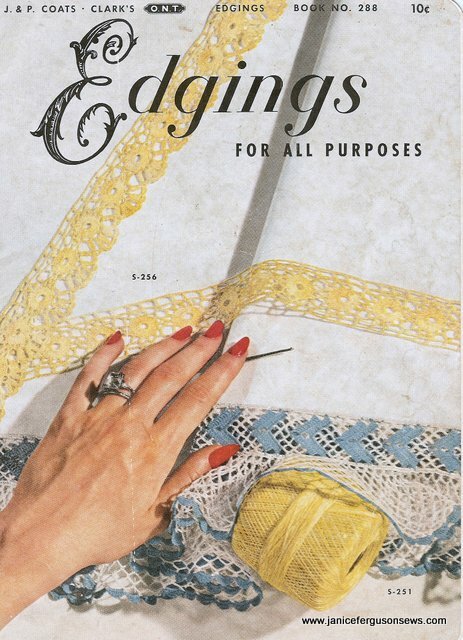 This 1952 needlework book includes several patterns/directions for making rick rack lace. 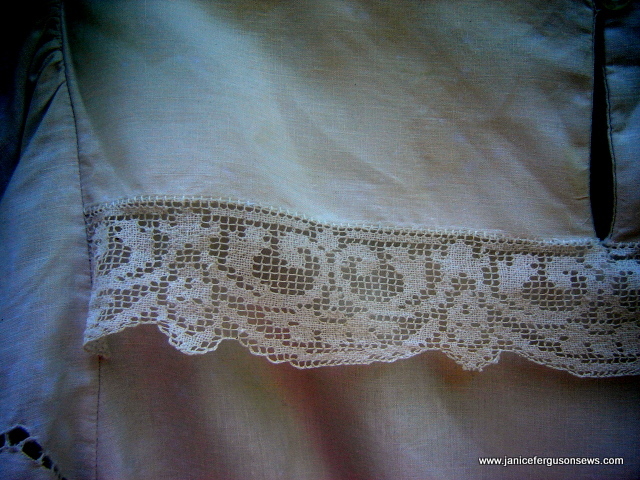 While the photo showing styles is certainly representative of the popular color waves of that time, the lace is very intricate and would be beautiful, I think, in neutrals or pastels. If I could really crochet, I’d try making some lengths of one or two patterns. 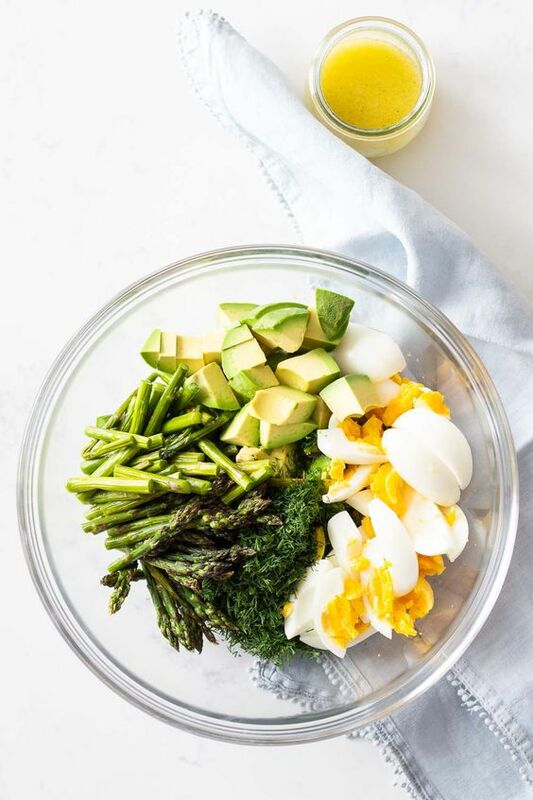 I wish one of you readers would make some and let us know how it goes. 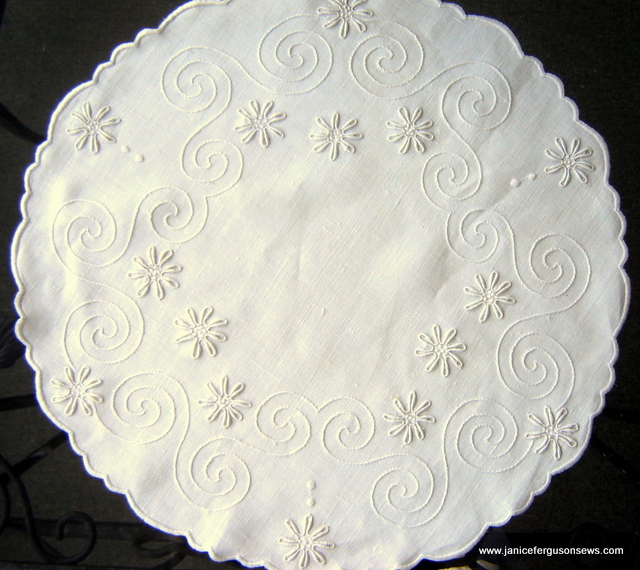 UPDATE: I found this site with wonderful pictures of rick rack lace. Check it out. Here are the directions. If you are unsuccessful in copying the image, post a comment requesting me to e-mail it to you. This is my White Wednesday post at Faded Charm. I hope 2012 is off to a good start for all of you. For us, the new year was kicked off in the midst of chaos rather than the cozy family gathering we had planned for our Christmas #2 celebration. First our pilot son was called away for a last minute flight to Denver. Then after the bonfire and s’mores, the grandchildren’s plans for a loud welcome to the new year were foiled by 6 year-old Robert’s battle with croup and Laurel’s virus. Finally, after unsuccessfully trying to soothe his cough with the cold air humidifier, my son-in-law and I left at 2 a.m. and drove 40 minutes each way to Robert’s home to retrieve his croup medicine. The remaining adults tended to Robert and Laurel. Being on the roads at that time was a little worrisome, but we arrived home safely. For Faded Charm’s White Wednesday, this is a rerun of an earlier post. I hope you find a tidbit or two that interest you.